Network Rail have been working to reduce the risk that level crossings pose. Healthwatch Suffolk has the power to shape, influence and improve local NHS and social care services in the county. It would appear that many local parishes are unhappy with the roadside services currently being supplied by Suffolk County Council and this issue is being addressed directly with our County Councillor, Andrew Stringer. If you want to read our monthly newsletter as an online publication please click on the link. The Grimmer - The Mere on the green! 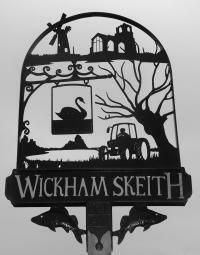 Welcome to the Wickham Skeith village website. We hope you will find something to interest you. Wickham Skeith is situated in North Suffolk, about 5 miles to the South West of Eye. It is a small but friendly place where there is always plenty going on. The Parish Council page will have copies of minutes and agendas for their regular meetings. Check out What's on for up-to-date list of village events or go to the Events Calendar for more detail. Are you interested in the history of our village? Did some of your ancestors live here? If so, have a look at the History pages. See our Clubs and Groups Page for an up-to-date glimpse of what is happening and reports on past functions. Would you like to hire a venue for an event? Check out our Village Hall pages for our current rates and facilities. Also see the Church page for an up-to-date programme of services. Interesting notes about and photos of St Andrew's can be found on the Suffolk churches web site here. The 456 and 459 routes pass through the village. Please click here for the current timetable. For other local buses, this link will take you to Galloways. For Local Weather Click Weather and where it says "enter city or postcode" enter IP23 and press Go. For Mid Suffolk Waste collection click here..